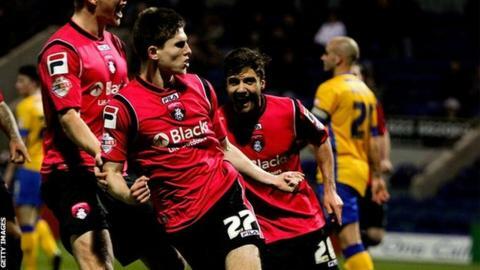 A brace from substitute Danny Philliskirk saw Oldham come from behind to defeat Scunthorpe and stretch their unbeaten run to seven matches. The striker finished from close-range on 66 minutes and pounced again seven minutes from time to lift Lee Johnson's side to 10th place in League One. Scunthorpe went ahead through Andrew Boyce's header but Oldham levelled when top scorer Jonathan Forte raced clear. Rory Fallon's debut strike regained the lead before Philliskirk's cameo. "I was really pleased with how patient we stayed. "The frustration was there and it was really important that we stayed patient. "In the first half I was very disappointed with the two goals for organisational reasons. "In League One when you go behind, it's very difficult to get back and today they've done that and I'm very proud of them." "I'm bitterly disappointed, but I think you've got to look at the bigger picture - it's a tough period. "All we're doing at the moment is firefighting. We've had three players making debuts today, five changes again to the starting line up, long-term injuries - it's very, very difficult. "We got our noses in front with two fantastic goals, so positivity at half-time was good but we've got to manage the second period better than that. "I hope I get time to turn it around because I believe in this group." Match ends, Oldham Athletic 3, Scunthorpe United 2. Second Half ends, Oldham Athletic 3, Scunthorpe United 2. Foul by Conor Wilkinson (Oldham Athletic). Shaun Brisley (Scunthorpe United) wins a free kick in the attacking half. Andrew Boyce (Scunthorpe United) wins a free kick in the defensive half. Foul by Amari Morgan-Smith (Oldham Athletic). Jennison Myrie-Williams (Scunthorpe United) wins a free kick in the defensive half. Attempt saved. Amari Morgan-Smith (Oldham Athletic) left footed shot from outside the box is saved in the centre of the goal. Attempt missed. Shaun Brisley (Scunthorpe United) header from the centre of the box misses to the left. Genséric Kusunga (Oldham Athletic) is shown the yellow card. Foul by Genséric Kusunga (Oldham Athletic). Billy Kee (Scunthorpe United) wins a free kick in the defensive half. Substitution, Scunthorpe United. Billy Kee replaces Neal Bishop. Goal! Oldham Athletic 3, Scunthorpe United 2. Danny Philliskirk (Oldham Athletic) header from very close range to the high centre of the goal. Assisted by Conor Wilkinson. Michael Jones (Oldham Athletic) wins a free kick in the defensive half. Substitution, Scunthorpe United. Matthew Sparrow replaces Rory Fallon. Substitution, Oldham Athletic. Amari Morgan-Smith replaces Carl Winchester. Marcus Williams (Scunthorpe United) is shown the yellow card. Attempt saved. Jonathan Forte (Oldham Athletic) header from the centre of the box is saved in the top left corner. Foul by James Wilson (Oldham Athletic). Rory Fallon (Scunthorpe United) wins a free kick in the defensive half. Substitution, Scunthorpe United. Hakeeb Adelakun replaces Gary McSheffrey. Luke O'Neill (Scunthorpe United) is shown the yellow card. Foul by Luke O'Neill (Scunthorpe United). Goal! Oldham Athletic 2, Scunthorpe United 2. Danny Philliskirk (Oldham Athletic) header from the right side of the six yard box to the centre of the goal. Assisted by Brian Wilson. Joseph Mills (Oldham Athletic) wins a free kick in the attacking half. Foul by Rory Fallon (Scunthorpe United). Andrew Boyce (Scunthorpe United) is shown the yellow card. Conor Wilkinson (Oldham Athletic) wins a free kick in the defensive half. Foul by Andrew Boyce (Scunthorpe United). Corner, Oldham Athletic. Conceded by Neal Bishop. Joseph Mills (Oldham Athletic) wins a free kick in the defensive half. Foul by Jennison Myrie-Williams (Scunthorpe United). Attempt saved. Michael Jones (Oldham Athletic) right footed shot from outside the box is saved in the bottom right corner.